The rare propaganda-ish 'Farm Animal' variant on the Visscher-Jansson Series map of New York, Virginia, and New England. Novi Belgii Novaeque Angliae Nec Non Pennsylvaniae et Partis Virginiae Tabula multis in locis emendata. A magnificent example of Justus Danckerts' 1690 Novi Belgii or map of New York, New England, Pennsylvania, and Virginia. Some call this the 'farm animal map' for its novel incorporation of farm animals, ranging from horses and cows to chicken and sheep, in its decoration – a propaganda embellishment unique to Danckerts' editions. It is considered the final map of the Jansson-Visscher Series, although there is some reason to cast doubt on this assumption. 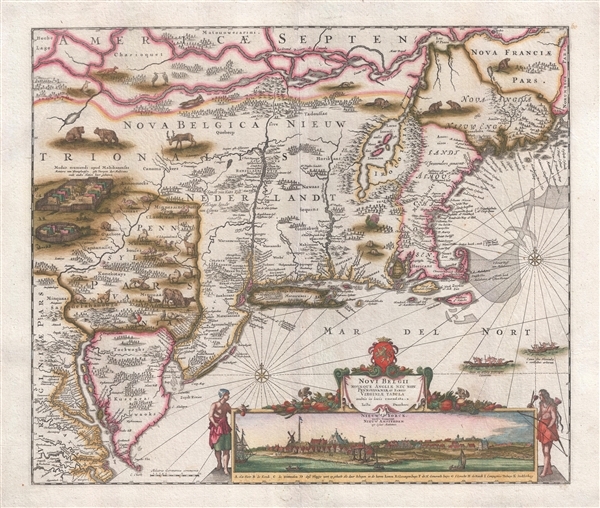 Some scholars suggest that this map was first produced in 1655, predating the Visscher map, while others, most notably Philip Burden, argue that it was most likely first issued in 1673 to capitalize on general interested associated with the Dutch recapture of New York in that same year. The failure of the Danckerts clan to date either their maps or atlases only contributes to this confusion. Like most maps in the Jansson-Visscher Series, the basic cartography here dates to the Jansson map of 1651. It covers from the St. Lawrence River to the Mouth of the Chesapeake Bay and from the Susquehanna River to the Penobscot River, incorporating in the process most of New England, New York, Pennsylvania, New Jersey, Virginia, Maryland, and Delaware. This edition features a number of important updates and revisions over the Visscher maps. The Delaware River is now fully redrawn such that it correctly does not connect to the Hudson – a common misconception in early maps. Pennsylvania is at last properly named. The Van der Donck Remonstrance may account for the addition of farm animals to this is this state of the map. Despite the Dutch retaking of New York from the British, many colonists were fully disillusioned with the lack of support received form the Dutch West India Company. The Remonstrance was intended to appeal directly to the States General for intervention and support – most of which would have come in the form of additional colonists. This map, which fills the blank spaces with domestic animals was re-engraved as a propaganda device intended to make the region seem more appealing to potential settlers. This would argue strongly for a 1655 date making it contemporary with the remonstrance. This present example corresponds to Burden's 3nd state, issued following the founding of Philadelphia. In the present example, Philadelphia is named, a distance scale has been added, and 'Pennsylvaniae et Partis' is here added to the cartouche. In addition, in accrodanced with the 3rd, c. 1690 state, this map adds Niew Castel alias Sandhoeck near Delaware Bay and Yermonton just north of Philadelphia. This map was issued in various Danckerts atlases, all of which were undated. Good. Some expert reinforcement along centerfold. Burden, P., The Mapping of North America II, no. 434, State 3. Augustyn, R. T., Cohen, P., Manhattan in Maps 1527 - 1995, p. 32-33. McCorkle, B. B, New England in Early Printed Maps 1513 - 1800, 680.2. Stokes, I. N. P., The Iconography of Manhattan Island, 1498-1909, vol. 1, pp. 148-151. Tooley, R.V., Mapping of America, p. 285, pl. 150.